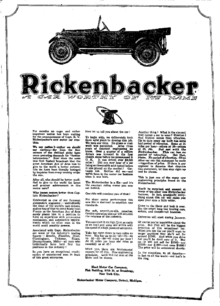 Rickenbacker Motor Company was a US automobile manufacturer located in Detroit, Michigan, from 1922 until 1927. Early six-cylinder engines were joined in 1925 by an eight-cylinder engine. The model was named Vertical Eight Super Fine which referred to the advanced proprietary engine and the high quality of the cars. The manufacturing equipment were sold to Audi and transported to Germany, somewhat ironic since Rickenbacker renounced his supposed German heritage (he was actually of Swiss ancestry) in light of World War I. This transaction was reflected in Audi Zwickau and Dresden models, using six- or eight-cylinder Rickenbacker engines. Some Rickenbacker cars still survive. A 1924 model was featured prominently in the Mr. Bevis episode of The Twilight Zone. ^ City Directories for Detroit, Michigan. R L Polk and Co. 1922. Retrieved 2010-10-08. ^ "CARS OF TO-DAY". Sunday Times (Perth, WA : 1902 - 1954). Perth, WA: National Library of Australia. 23 August 1925. p. 5 Section: Third Section. Retrieved 16 August 2013.